Coupon Description: MoreBeer.com is currently has a promo code for a Speidel 16 Gallon Plastic Fermenter. The future is here and the future is HDPE Fermentation & Storage Tanks from Speidel. Are you tired of carboys? Hate siphoning to transfer? Wish you could ferment larger batches in a single container? Sick of lifting 50lbs by a small metal handle? Done with worrying about shattered glass, injury and lost product? Well then have we got the solution for you! Speidel makes some of the best homebrewing ferementers out there and this is one of them. Coupon Description: MoreBeer.com is currently has a promo code where you can get a Stainless Steel Weldless Ball Valve for just $26.95. Do you have a kettle or cooler but would like the ease and convenience of using a ball valve to easily drain liquid? The problem with most weldless fittings is they are thrown together from assorted hardware. Common issues include leaking and lots of flex when you use the ball valve. These new weldless fittings feature are designed for brewing. These are easy to install and make your brewing session a heck of a lot easier. Coupon Description: MoreBeer.com is currently having a sale on over 60 popular home brewing items including Blichmann home brewing kettle and stainless steel conical fermenters. You can save nearly 50% on some items! Click the image above to check out the items that are currently available for this More Beer homebrew sale! Coupon Description: This MoreBeer.com coupon code gets you a Stainless Steel Home Brewing Fermenter for just $195. You can upgrade your home brewery with an innovative, Stainless Steel 7 Gallon Brew Bucket Homebrewing Fermenter. You will enjoy many of the benefits of a stainless conical fermenter but at a fraction of the cost. This stainless steel home brewing fermenter is made by SS Brew Tech from high quality 304 Stainless Steel. The Brew Bucket home brewing fermenter is not only functional but also affordable, especially with this MoreBeer Promo Code. 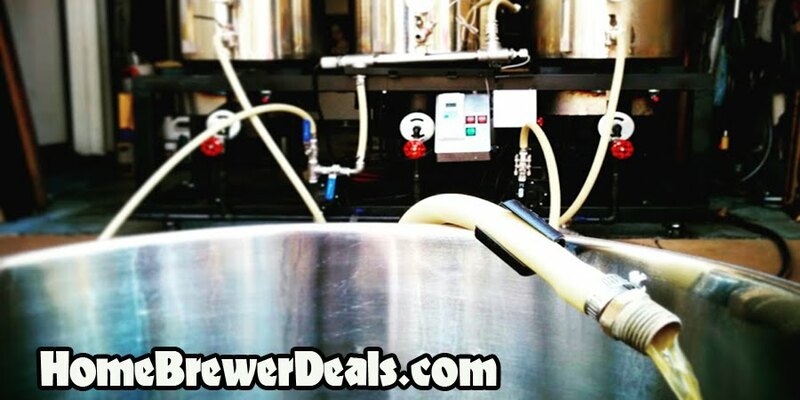 Coupon Description: This MoreBeer.com coupon code is for a Home Brewing Carboy & Keg Washer. Mark’s Keg Washer is designed to clean and sanitize home brewing vessels like homebrew kegs, fermentors, buckets and carboys. It is also intended to provide a sanitation container for miscellaneous items such as airlocks, thermometers, tubing, keg fittings, and more. It is a great way to speed up your cleaning process while at the same time doing less work. This is an all around great homebrewing cleaner and homebrew equipment washer. Save Up To 25% On Home Brewing Kettles! Promotion Details: Save Up To 25% On Home Brewing Kettles! Coupon Description: Great Fermentations has a promotion going on where you can save big on home brewing kettles, including Blichmann G2 kettles and Anvil homebrew kettles. Coupon Description: Right now there is a deal on Amazon where you can save 40% on a propane home brewing burner and stand. If you act now you can get this burner stand for just $46.99 and it qualifies for free prime shipping. This burner is super fuel efficient and is great for 5 gallon homebrewing batches. Coupon Description: HomebrewSupply.com currently has a promotion going on where you can save 15% on their Homebrewing Gift Cards! If you have never homebrewed before and are unsure what to gift your homebrewing friends and family, or if you simply want to give a homebrewer you know the ability to buy what they want then a gift card is a great choice! Since they are 15% off, this is also a great time to save yourself 15% on a future order! Heavy duty construction is durable and resists oxygen transfer. None of the risks of working with glass. Coupon Item Description: Adventures in Homebrewing currently has a promotion going on where you can Save $40 on a New Blichmann G2 Homebrewing Kettle. They have several of Blichmann’s new line of home brewing kettles on sale, the one shown above is their 20 gallon G2 and you can get it for $40 off if you act now! I am not too sure how long this home brewing coupon is for, so act soon to take advantage of this limited time offer.